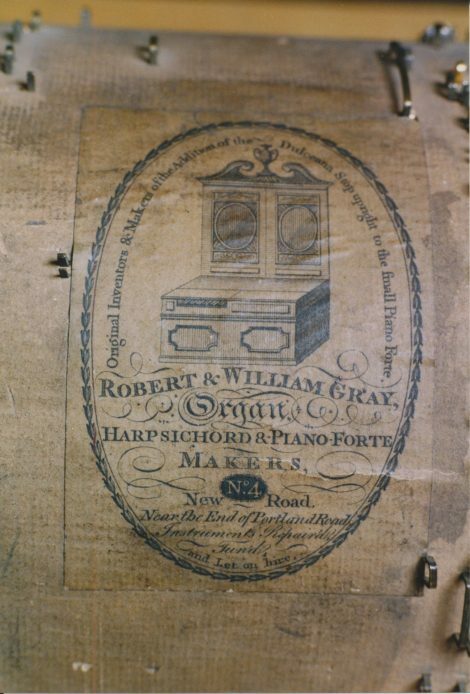 This organ was made by an otherwise unknown organ builder called William Davy. On the base of the top case is inscribed: Davy/ April 1788/ Crown Court Covent Garden William Davy appears in the Sun Fire Insurance Records, collected by Lance Whitehead and Jenny Nex, published in the Galpin Society Journal and available online at http://www.galpinsociety.org/galpinextras/GS_Whitehead&Nex_A_to_D.pdf Davy occupied this address from about 1774 to 1794. He seems to have been a small time builder, perhaps apprenticed to the Gray brothers and set up on his own, perhaps mostly working for them. The pipework in this organ is similar to their work and one barrel has their advertising label on it. The stop list is Stop Diapason, Principal, Flute, Twelfth and Fifteenth. The compass is 21 notes cº fº gº aº a#º bº c¹ d¹ e¹ f¹ f#¹ g¹ a¹ a#¹ b¹ c² d² e² f² g² a². One barrel is pinned in a spiral, playing Grand Chorus in the Messiah The other has ten tunes: Is this a Dream, How pleasant is thy, 100 Psalm, 104 ditto, Harrington’s Retirement, Easter Hymn, The Lord My Pasture, Coronation March, How Sweet in the Woodlands, Voluntary by Stanley. These are mostly common and well-known tunes. Two tunes by Henry Harington might suggest a Bath connection. This organ was restored by Dominic Gwynn and Tudor Roberts in 1988, including a new bellows, which was missing.